How to change the filters of Samsung Dishwasher? 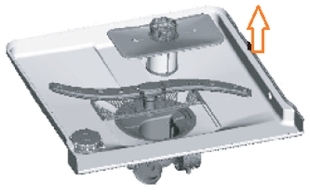 For your convenience, we have placed the drain pump and filtering system within easy reach inside the tub. There are three components of the filtering system: the main filter, the coarse filter, and the fine filter. a) Main filter: Food and soil particles trapped by this filter are pulverized by a special jet on the lower spray arm and washed down the drain. b) Coarse filter: Larger items, such as pieces of bone or glass, that could clog the drain are trapped in the coarse filter. To remove an item caught in this filter, gently squeeze the tabs on top of this filter and lift it out. c) Fine filter: This filter holds soil and food residue in the sump area and prevents it to redeposit on the dishes during a cycle. Note: Do not put the fine filter upside down. 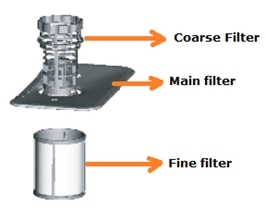 ● For best performance and results, the filter assembly must be cleaned. The filter efficiently removes food particles from the wash water, allowing it to be recirculated during the cycle. For this reason, it is a good idea to remove the larger food particles trapped in the filter after each wash cycle by rinsing the semicircular filter and cup under running water. To remove the filter assembly, turn it in anti-clockwise direction and lift the filter assembly up. The entire filter assembly should be cleaned regularly. ● To clean the coarse filter and the fine filter, use a cleaning brush. 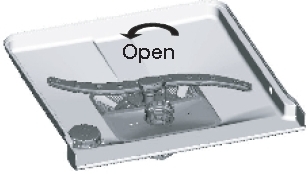 Then, reinsert the entire assembly in the dishwasher, positioning in its seat, pressing downward, turning it clockwise direction. ● The dishwasher must never be used without the filters. Improper replacement of the filter may reduce the performance level of the appliance and damage dishes and utensils. Note: Never run the dishwasher without the filters in place. When cleaning the filters, do not damage them. Otherwise the filters may not perform as intended and poor wash results or damage to the internal parts may be encountered. How to clean the drain pump of my dishwasher?